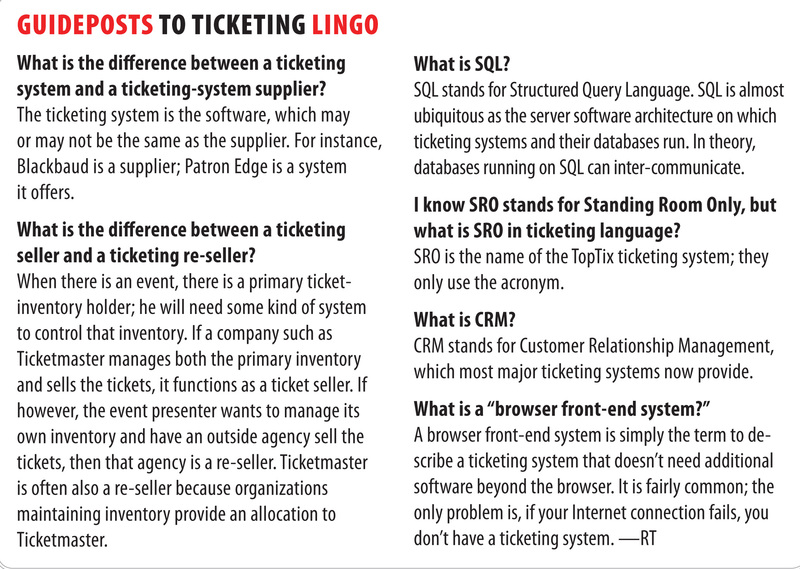 There are literally hundreds of so-called ticketing system suppliers, ranging from major national and international companies like Ticketmaster to regional and local ones. 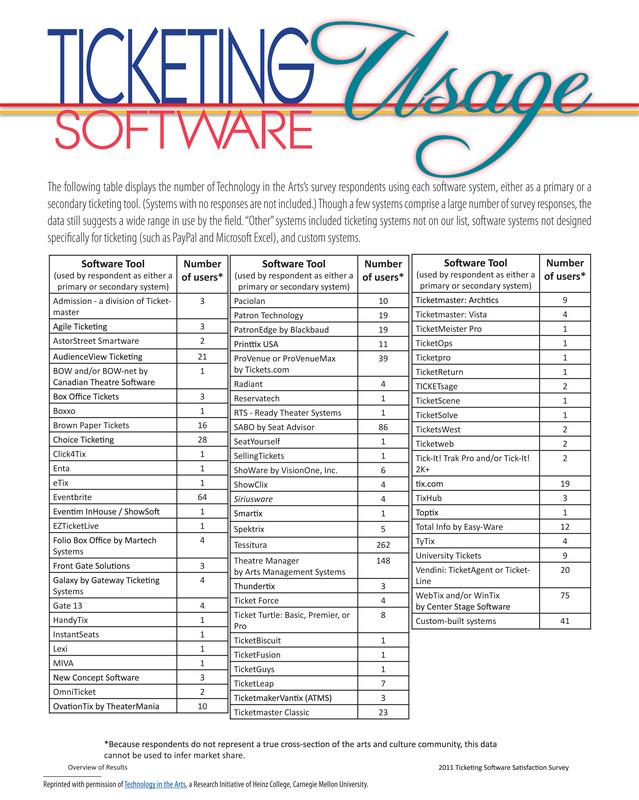 They can vary from the comprehensive “software solutions” types such as Tessitura to the basic browser-based web ticketing services or re-sellers from Ticketmaster down. It is almost impossible to compare these (despite my editor’s prodding to do so). Most recognized ticketing systems can offer the latest must-have technology—just look at the rush to deliver social media integration. It may be stating the obvious, but “buyer beware” and make careful cost comparisons. These systems offer state-of-the-art comprehensive functionality; they also provide a platform for interfacing with other software solutions and databases—SQL is ubiquitous—and serve as a one-stop-shop for customer interfacing in all areas, such as e-marketing, social media, web sites, loyalty schemes, memberships, subscriptions, and fund-raising. There is a higher price tag for this—for generally larger supplier sales, support, and service teams, with a high level of knowledge about the operating environment in user organizations. ENTA (Baton Rouge, LA), which drives arts and entertainment organizations in 24 countries. Tickets.com (HQ in Costa Mesa, CA) also in multiple countries, with a variety of solutions. Paciolan (Irvine, CA) has a long list of clients from sports to the performing arts. Vendini (San Francisco, CA) aims at an inclusive lower price; in the arts. Its clients range from high schools to Broadway theaters. Choice (Boulder, CO) created a system for the needs of the Toledo Symphony Orchestra and now has over 250 users. Theatre Manager from Arts Management Systems (Calgary, Canada) is a long-term survivor that, like Tessitura, never charges per-ticket fees, has a large user base, and offers comprehensive functionality for arts organizations. The advantages of all these are the great software functionality, the user base and user-group conferences, and the constant up-grade path, with continual development of the software and regular releases of new versions. The only disadvantage is the relatively high cost, in most cases worth it for the broad functionality, and the need for “intelligent users [in-house] for intelligent systems.” Watch out for the implementation process—be sure that the scope of work delivers what you want. Blackbaud (HQ in Charleston, SC) with its Patron Edge (system known by some as TopTix SRO, which develops the software for them) adds ticketing to its international portfolio of fund-raising and arts management software solutions, though some users say the interfacing is not as seamless as they would like it. TopTix (Kamiel, Israel) also supplies its SRO Version 4, which represents the next generation in software development for ticketing in terms of openness and interfacing with the customer. Seat Advisor (San Diego, CA) has clocked up a large number of users internationally for its web-based, browser front-end system on a pay-as-you-go basis, though it faces competition from a whole series of me-too web system suppliers. The advantage here is who started first, because generally the more users, the more sophisticated the system, as more tools are added to meet different clients’ needs. In this case, watch out for the costs—they can add up to the same or more than the Box One suppliers if you sell at high volumes. The enterprising Gene Carr of Patron Technology (New York, NY) is another challenger with his ticketing and CRM-based solution built on Sales Force. PatronManager CRM gets it right by marrying intelligent CRM with the distribution of the work-load at a task level. Without any synchronizing with other products, this kind of solution is recommended from the small scale right on up, sold on a per-ticket fee model, which many organizations—and their ticket purchasers—find helpful. Agile (Hermitage, TN) emphasizes an attention to detail and a well-honed focus on understanding users’ unique needs. Its Venue Manager Pro offers a great range of key tools. Easyware’s Total Info (Chicago, IL) is an integrated solution bringing a series of tools together dedicated to the not-for-profit sector. Suited to those with a high sensitivity to cost, it publishes its cost up front, so you know exactly what you’ll have to pay, in advance. Managing the databases and information needs with a comprehensive ticketing solution, this is a high-specification but affordable solution. These suppliers are all in the business of achieving customer satisfaction, helping people work smarter, enabling venues to thrive as well as survive in these challenging economic circumstances. Expect a range of ways to pay for the system and ensure the company understands your operating circumstances. This is a big group, comprised of both time-served survivors and start-ups. This chart lists quite a few suppliers with only one or two users. Some of the older ones have left their product restricted to just ticketing, but they are up against the newer web-based ticketing services with a huge range of solutions and prices. To be clear, if you look at the likes of EventBrite, you are not looking at solutions comparable with those in Category One or Two. Yet the kinds of fees charged can add up significantly, for both the organization and the ticket buyer. TicketFly (San Francisco, CA) aims to go beyond this, joining up the marketing, social media, and ticketing functions into one tool on a single platform for promoters and venues. TicketBud (Austin, TX) aims to disrupt this marketplace with what it calls “greed-free ticketing” by offering an Internet ticketing service capped at a total cost of $99 per event. Many ticket agents are hard to define in any box: Ticketmaster offers various services and software solutions, though their Archtics system, originating in sports, seems to have fewer fans amongst performing arts users. For those with only the most basic requirements, there are systems of a completely different ethos, such as Brown Paper Tickets. The danger in this Category is whether these suppliers actually offer competitive solutions in terms of their functionality from a marketing and CRM perspective, as well as ticketing. 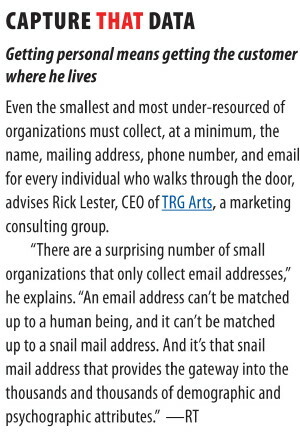 They can often cost more than total solutions in the other categories, though there are exceptions. There is a huge range of choice, and it can’t be said often enough: buyer beware. 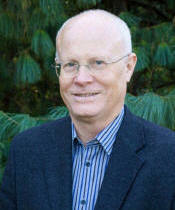 Roger Tomlinson is a London-based management and marketing consultant, working in the arts and entertainment sectors. An expert on integrated solutions and developing online technologies for ticketing and marketing, he has authored several books including Full House: Turning Data Into Audiences and Boxing Clever, Developing and Managing a Website. He also produces the The Ticketing Institute information web site.